Abi Scheid takes a contested shot. The sophomore had 18 points, but it wasn’t enough for the Wildcats to overcome Michigan. After making just one of her eight shots in the first 20 minutes, Jordan Hamilton ran to the left side of the floor behind the 3-point line, and began to warm-up for the second half. The freshman guard had just finished a conversation with one of Northwestern’s assistant coaches about her hand placement on the ball, which affected its rotation and contributed to her team’s offensive struggles. But the adjustment wasn’t enough to fix the Wildcats’ offense, which managed only 59 points in a loss to No. 16 Michigan on Sunday. Hamilton made her first three of the day, which gave NU (9-14, 2-7 Big Ten) an early 5-2 lead against the Wolverines (19-4, 8-2). But she didn’t make any of the next 11 shots she took, and the Cats failed to match the Wolverines’ firepower in their 80-59 loss. Coach Joe McKeown said one of the most aggressive and technically sound defenses in the conference prevented Hamilton and NU from finding a rhythm. After going 1-for-8 in the first half, Hamilton missed all three of her attempts in the second, including two 3-pointers from the spot where she practiced during halftime with assistant coach Tasha Pointer giving feedback from across the court. “Thumb,” Pointer shouted from the bench as she watched the freshman guard struggle during shootaround and the second half. 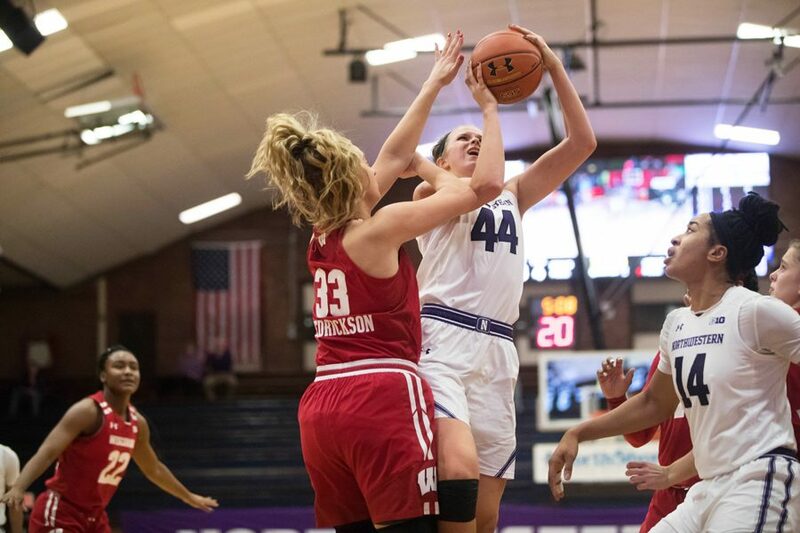 But like Hamilton’s fingers in her 3-point outing Sunday, NU’s entire offense seemed out of place as it finished with just 59 points on 39.7 percent shooting. After scoring 23 points in the first quarter of their near-upset of No. 14 Maryland on Thursday, the Cats scored just 13 in the first ten minutes against the Wolverines. They made two of their first three shots against Michigan, including Hamilton’s 3-pointer that gave NU its only lead, but the Cats followed with nine consecutive misses and were held scoreless for five minutes. McKeown said his team’s most consistent success comes on the fastbreak, but the Cats couldn’t earn those opportunities against an experienced Michigan team. Also, with the junior forward Pallas Kunaiyi-Akpanah being double-teamed throughout the game, he said there was an added burden for Hamilton and Lindsey Pulliam to score on the perimeter. But the freshmen guards combined to shoot just 17 percent from beyond the arc, and McKeown said the Wolverines disrupted their flow and prevented anyone from turning the momentum of the game around. The Cats are a team that has to win games in the 50s and 60s, he said, and the inability for anyone to provide a spark like Michigan guard Katelynn Flaherty, who finished with 27 points, kept the game uncompetitive in the second half.